EXPERIENCE YOU CAN COUNT ON…For over 50 years, the Landau Lawyers League (LLL) has organized quality sports leagues for attorneys and firm personnel. LLL is a nonprofit corporation designed to serve attorneys and is committed to providing recreation excellence of fun and competition against their colleagues. Teams compete in ability balanced athletic competitions in prime venues throughout Los Angeles. Check yourself out on our Basketball Photo page! See yourself in action on our Softball Photo page! 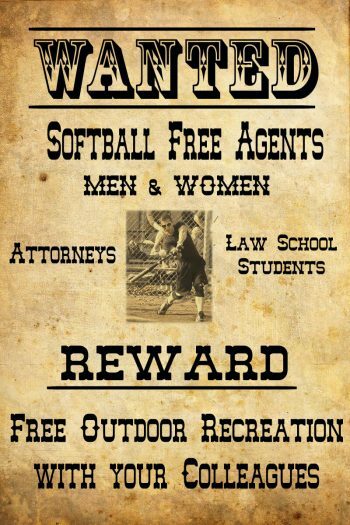 Basketball and Softball Free Agents Wanted! Lots of playing time, no cost to you.